It is the beautiful Subatu Temple which is in the Bali central, Tampaksiring. 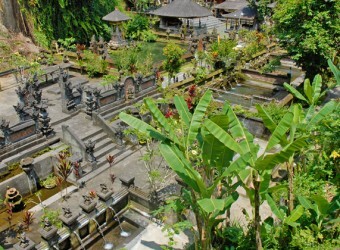 The temple is surrounded by the forest, and it looks like a park. There is the spring where the clean water gushes. And, there is the fountain with reliefs in the big pond, and fish are living in the clear water. You will be heal by the holey spring and full of green leaves, and the sound of flowing water makes you feel relieve. Water spring out of the bathing place is very clear. The entire temple was in mystical atmosphere. A temple that is full of green, make my heart healed. I recommend you this temple.